About 18 months ago I wrote a post about books I’d love to read for one of Liz’s Tuesday Top Five series, then promptly forgot about it and did nothing to make my way through the five books I’d selected. I had picked this particular five based on books everyone else seemed to love or books I thought I should read because they crop up on every ‘Top 10/100/1001’ list I’ve come across. Obviously there are many more in this category but it was top five so I limited myself. The Hitchhiker’s Guide to the Galaxy by Douglas Adams is the first of the list I’ve actually managed to read. It doesn’t bode well for the rest. Despite the fact that I couldn’t find a bad review on GoodReads and the average star rating was 4.5 this really wasn’t my kind of book. It was too spacey (as in all about outer-space…. obviously) and half the time I didn’t know what was going on. I will give it one thing, Adams did squeeze in some great one-liners and the concept (at least what I got from it) was pretty funny. A few of my favourite lines…. And being a Geography teacher I particularly liked this one…. When I mentioned to my sister that I was reading this book she was a bit bemused, she knew it wouldn’t be my thing, she was right. Having said that it is one she really did enjoy and I think most people would – clearly given all the gushing reviews I’ve come across – so don’t let my poor response to it sway you from picking up this classic. Have you ever read one of these top rated books only to be disappointed by it? Or perhaps you’ve read one that was totally wonderful that you’d like to share with the rest of us. I’ve got plenty on my shelves to keep me going for a while, but when I get back to my top five list I think I’ll tackle Tolstoy’s Anna Karenina. What is everyone else reading at the moment? This entry was posted in Books and tagged book review, books, fiction books, reading. Bookmark the permalink. I’ve just finished The Rosie Project which I had high expectations for but it unfortunately didn’t live up to them. I lost interest a bit and found it quite predictable. Today I started an old old favourite, which I like to go back to every now and then, Little Women. I always enjoy reading it, like visiting an old friend, though i’m worried how I’ll go at the very sad part whilst reading it on the train. I return to that one time and again too. I love Jo, I always wanted to be her! Do you know I’ve never read it either because despite its popularity, it’s just never appealed. Craig absolutely loved it though. And he’s not a reader at all! Yeah, I definitely think Mr Good would enjoy it more than me. I have just finished The People Smuggler, a very good and very confronting book. And The End of Your Life Book Club, which I think is a wonderful book – not at all what I was expecting. I love Anna Karenina, but it is years since I read it. Both sound interesting, I’ll put them on my list. I read this two flats ago with my husband-then-boyfriend. Hes a faster reader than me, and was very quick with this coz he loves it so much. We lay side by side in bed and I’d tap him or say ‘ding!’ when I was ready to turn the page. I liked it but probably adopted some of my husband’s affection for it because of him. Maybe it was unconscious so I could tolerate all the giggling. I also very much liked Adams’ Last Chance To See, which was excellent. I’m not reading anything these days except my feeds, the weekend Age when I can and a Quarterly Essay for two quarters ago! I definitely think this would appeal more to Mr Good than it did to me. I like the idea of reading a book at the same time, but considering we like completely different styles and it takes Mr Good about six months to get through a novel I don’t think it’s going to happen. However when we were backpacking around Vietnam some years ago we each took one book and swapped half way though the trip. I took Life of Pi, Mr Good hated this book with a passion unobserved before. Not only did I love hitchhikers guide to the galaxy (read last century when I was a teenager) but it had a profound effect on me. I guess it is horses for courses and that’s why reading book reviews is a silly way to find a book that you will like/love. I HATED Eat, Pray, Love. It was the most boring pile of toss that I had ever picked up and I couldn’t even finish reading it it was that bad but the reviews were glowing and EVERYONE was reading it, loving it and having it “change their lives”. Reading a book is a very personal thing and again, you never know what is going to be a “good book” to you until you pick it up and read it. 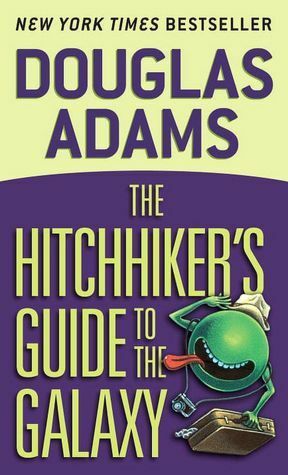 I’ve read three of the four books that comprise the Hitchhikers “Trilogy” and I have to say that, apart from the first 20 pages of Hitchhikers Guide to the Galaxy I’ve always thought it overrated. I much prefer his Dirk Gently series. They’re still a bit all over the place, but at least there’s a coherent plot to them!! Yes the plot was a bit thin on the ground. And I will be sure not to bother with the rest of the trilogy, really not my thing.